If you are experiencing an emergency of any kind. Go to our local weather page for the latest weather and forecast. Bonny Doon Fire and Rescue depends on our community members to support the Fire Team. Every donation to our 501(c)(3) organization helps! We are an all-volunteer first-responder unit of the Santa Cruz County Fire Department. We respond along with the CalFire engine crew from the Fall Creek Station on Empire Grade to emergencies in the Bonny Doon area. These include medical emergencies, motor vehicle accidents, injured hikers, mountain bikers or horseback riders, as well as both structure and wildland fires. We operate five vehicles (two fire engines, a water tender, a 4WD rescue squad, and a 4WD utility truck) and are equipped to handle vehicle extrications and cliff rescues down to Highway One, and to assist the Davenport Volunteers of Company 37. In addition to receiving training in firefighting and rescue scenarios, all our volunteers are Emergency Medical Responders (EMRs) or Emergency Medical Technicians (EMTs). We also carry medical bags and equipment in own personal vehicles so we can quickly respond to incidents near us without a fire engine. Being an all-volunteer fire company, our firefighters do not get paid a regular salary. However, this does not mean we are any less professional! Every one of our firefighter and medical staff undergoes the same extensive training as paid firefighters. We are actively looking to recruit more community members to be a part of our Fire Team! County fire provides all the training, personal saftey equipment, and medical response bags to our volunteers free of charge. There is a place for you with Bonny Doon Fire, visit our team page or join us at the fire station during trainig to find out more. Backyard burn season runs through the end of April. For permits, visit mbard.org for more information. Sunday, May 19 from 9am - 1pm at the Martin Fire Station 975 Martin Rd in Bonny Doon. 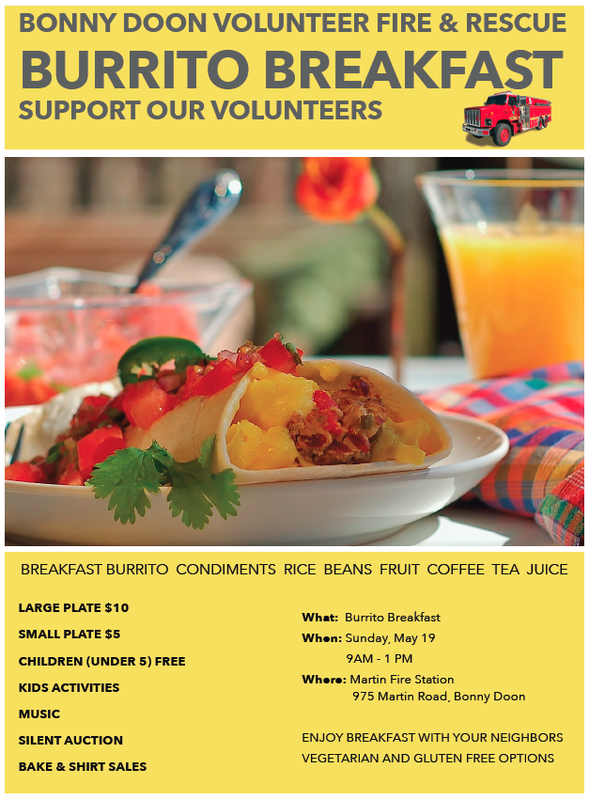 Bonny Doon Volunteer Fire and Rescue will be hosting our annual fundraising breakfast on May 19, 2019 from 9am to 1pm at Martin Road Fire Station, 975 Martin Road, Bonny Doon. This is an opportunity to support our volunteers that respond to emergencies in the Bonny Doon area. This includes medical emergencies, motor vehicle accidents, injured hikers, mountain bikers or horseback riders and both woodland and structure fires. The Burrito Breakfast will include a breakfast burrito, condiments, rice, beans, fruit, juice, coffee and tea. Children under 5 are free. A small plate will cost $5 and the cost of a large plate will be $10. There will be activities for children, live music, bake and shirt sale, and a silent auction. Proceeds of fundraising events go towards the purchase of firefighting and emergency medical equipment and equipment maintenance. This friendly event is a good way to meet your neighbors and to be informed. CERT, Cal Fire, Bonny Doon Fire & Rescue and the Santa Cruz Fire Safe Council will have representatives on hand to share information regarding fire and wildfire safety. The California fire season is nearing, it is time to prepare. Support our volunteers and enjoy breakfast with the community. Bonny Doon Fire and Rescue, Inc. is actively looking to recruit more community members. County fire provides all the training, personal safety equipment, and medical response bags free of charge to the volunteers. Members of the community will have an opportunity to inquire about being a volunteer at the breakfast. “We are a family” is how one volunteer described being a member of the volunteer fire team. The all-volunteer firefighters are not paid. Yet every one of the firefighters and medical staff undergoes the same extensive training as paid firefighters. Bonny Doon Fire Team was dispatched 135 times in the last 6 months. Volunteers are equipped to handle vehicle extrications and cliff rescues down to Highway 1. They are trained in firefighting and rescue scenarios and all the volunteers are Emergency Medical Responders or Emergency Medical Technicians. Saturday, August 25th 2018 will be this year's first annual Taco Social to benefit the Bonny Doon Fire Team. 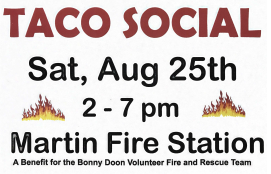 The Taco Social will be the primary fund raiser for the Bonny Doon Fire Team this year, and besides funding the Bonny Doon Volunteer Fire and Rescue Team, it is bound to be informative for the community as well as a lot of fun for the entire family. The Bonny Doon organizations that are sponsoring the event include the Bonny Doon Fire and Rescue Team, the Bonny Doon Community Emergency Response Team (CERT), the Bonny Doon Fire Safe Council, Friends of the Bonny Doon Ecological Reserve, Local Bonny Doon Ham Radio operators and the Rural Bonny Doon Association. Each of the organizations will have an information booth to share info on how to prepare for (or avoid) a disaster. In addition, CalFIRE, PG&E, and Animal Rescue folks will also be on hand to provide useful information on what to do in the event of an emergency, and how you can prepare yourselves and your family and pets. In addition to delicious $5 tacos and associated refreshments, there will be live music provided by great local musicians Charlie and Jessica, Bob Peters, and Andy Fuhrman, and activities for the kids, including a bounce house. This gala event will be held from 2 to 7 PM, so save the date, and we hope to see you there! We are also looking for volunteers. Tasks include helping to set up on Friday, assisting at the event itself on Saturday, and final cleanup tasks on Sunday. If you have questions or would like to volunteer, please contact BonnyDoonCERT@gmail.com.